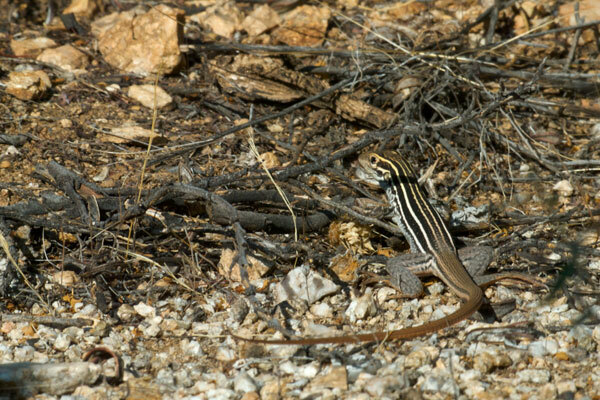 My friend David Sloo and I saw six of these very large whiptails promenading about on our morning hike. Unfortunately, they were even more camera-shy than other whiptails (which is saying a lot), and this terrible picture is the only shot I managed to get of any of them. This particular lizard, the first one we saw of this species, was winning a long battle with a very large cicada. We saw the whiptail pounce on the unsuspecting cicada, get a good grip, then thrash its head back and forth trying to batter the cicada senseless. The cicada was buzzing like mad trying to loosen itself from the whiptail's jaws, but to no avail. Eventually the silence of the cicada indicated the whiptail's victory and breakfast. This species was placed in the genus Cnemidophorus until recently, so older reference books still use that name. 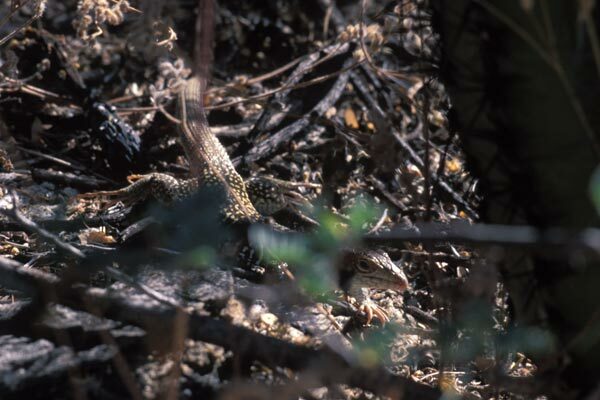 Giant Spotted Whiptails are not at all cooperative. Youngsters, like the one pictured here, look significantly different than full-grown adults. The youngsters have prominent stripes, whereas the old ones have faint stripes at best and lots of spots. But neither the youngsters nor the old ones are at all cooperative.